Once upon a time, the printing industry was full of small, craft-specific trade associations and fraternal groups that gave it a soulful center of gravity it doesn’t have today. Operating on shoestrings, these grass-roots guilds lacked the extended organizational structures and the revenue-focused business objectives that give national trade associations their heft. What they had going for them, mostly, were the warm feelings of good fellowship they inspired and the genuine pleasure their members always took in one another’s company. When these groups and clubs thrived, it was for two reasons: the engagement of the members and the quality of the professional leadership. The former wasn’t possible without the latter. The key to everything was the guidance of executive directors who could rally the troops, plan the activities, sweat the small details, and keep all their members mindful of why they enjoyed being with one another as much as they did. No circle of friends or person-in-charge ever made the small-group model work more winningly than the Typographers Association of New York (TANY) and John Trieste, the association executive who shepherded it for more than 30 years. TANY is no longer active as an association, but there are still plenty of former members who remember the good times they had when it was. Something else they can’t forget is how much of the joy of their shared experience they owe to Trieste. 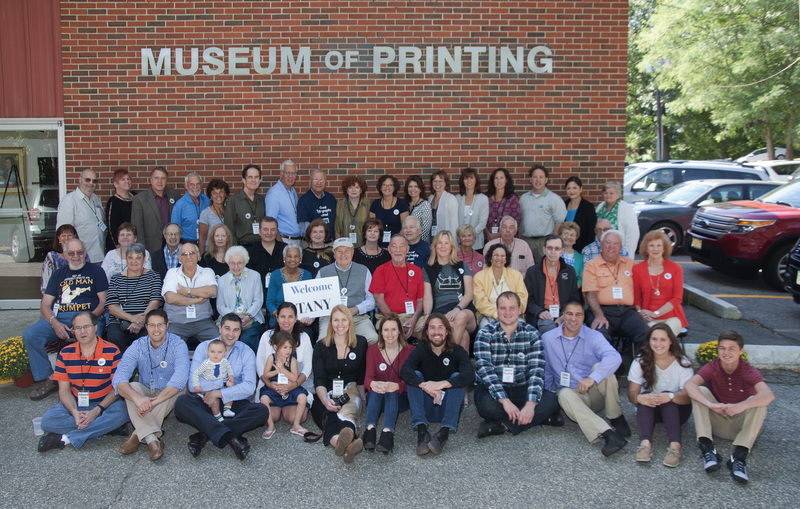 And so came more than 50 people to the Museum of Printing in Haverhill, MA, on September 17 to celebrate what they said was but probably wasn’t their “last reunion.” They joined the Museum in dedicating a library to Trieste in recognition of his exceptional record of service to TANY and the other New York metro area trade associations he oversaw. The guests, numbering more than 50, included 22 members of the honoree’s extended family. Everyone shared in the pride of seeing him receive the permanent tribute that the designation of the space in his name represents. Fittingly, the John Trieste Library will serve as the Museum’s learning center for the study of the art and the science of typography. The Museum’s chief curator and principal organizer, Frank J. Romano, is a leading expert on typography and a former member of TANY himself. A guest lecturer at many TANY functions, Romano officiated at the library dedication ceremony and hosted a banquet in Trieste’s honor in another part of the Museum. The event also was an occasion for Trieste to talk about his years with TANY and the trajectory that industry groups followed during and after that time. He wasn’t always a trade association executive, having worked as a letterpress pressman and a mapmaker for 10 years before being hired by the New York Employing Printers Association (NYEPA) in 1960.Within five years, NYEPA, a network of groups representing the owners of 1,500 printing firms and trade shops, had asked him to take over the management of a number of the groups including the Brooklyn Printers Association, the Printing Estimators and Production Men’s Club, and the typographers’ section that became TANY. 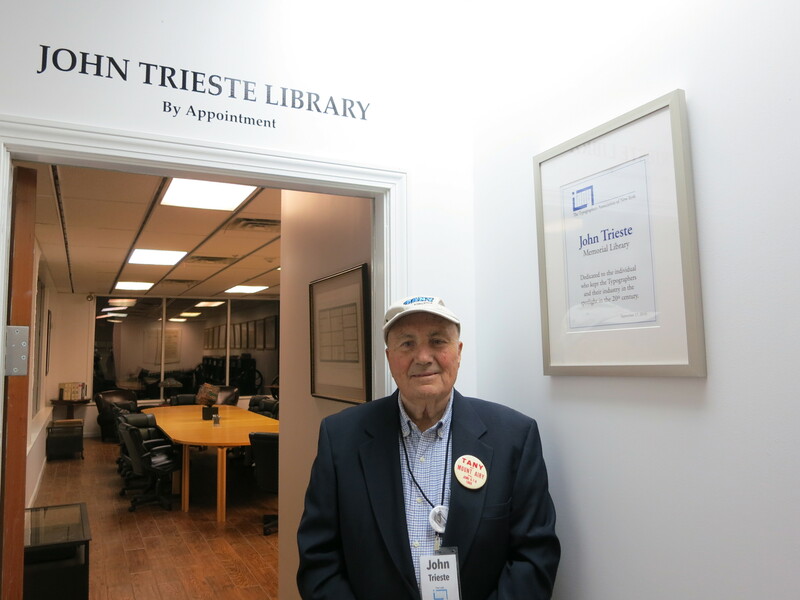 Later, on behalf of other umbrella organizations for the metro area, Trieste would also run the Sales Association of the Graphic Arts, the Long Island Graphic Arts Association, and the Binders and Finishers Association. Mavis Da Costa, a career administrator who is as revered by TANY for her contributions as Trieste is for his, assisted him in many of these assignments. Trieste knit TANY together with regular meetings in which expert speakers briefed the group on best business practices, technological developments, and other essential topics for providers of typographic services. A regular presenter at these gatherings was Jack Powers, a consulting technologist who was one of the first industry observers to perceive the impact that desktop publishing and digitization would have on graphics firms of all kinds in the metro area. TANY members bonded personally through social gatherings and excursions to resort areas like Atlantic City and the Poconos—all courtesy of Trieste, who also photographed every event he emceed. Many of these images took attendees at the tribute on a stroll down memory lane in a pair of nostalgic slide shows that were among the high points of the program. At its peak, TANY had an office on Eighth Avenue at 34th Street and 180 companies, union and non-union, on its member roster. However, times and technologies were changing, and the group’s fortunes changed along with them. Trieste recalls membership dropping sharply in 1991 and 1992 as in-house typesetting and composition chipped steadily away at customers’ need to obtain these services from trade shops. Many typographic firms closed, merged, or morphed into other kinds of businesses. By 1997, there weren’t enough dues-paying members left to cover TANY’s expenses, and Trieste reluctantly suspended operations the following year. He then retired to Florida—but “retired,” in the case of someone with Trieste’s full-time organizational instincts, is a highly relative term. He engaged with causes related to Alzheimer’s Disease and was active with his local chapter of AARP. Ever the event planner, he inaugurated a reunion of other industry members who had retired to the Sunshine State and kept the annual snowbird get-together going for 12 years. He currently is a contributing writer for Senior Life of Florida, which publishes his monthly column on affordable, educational, and family-friendly tourist destinations in the central part of the state. 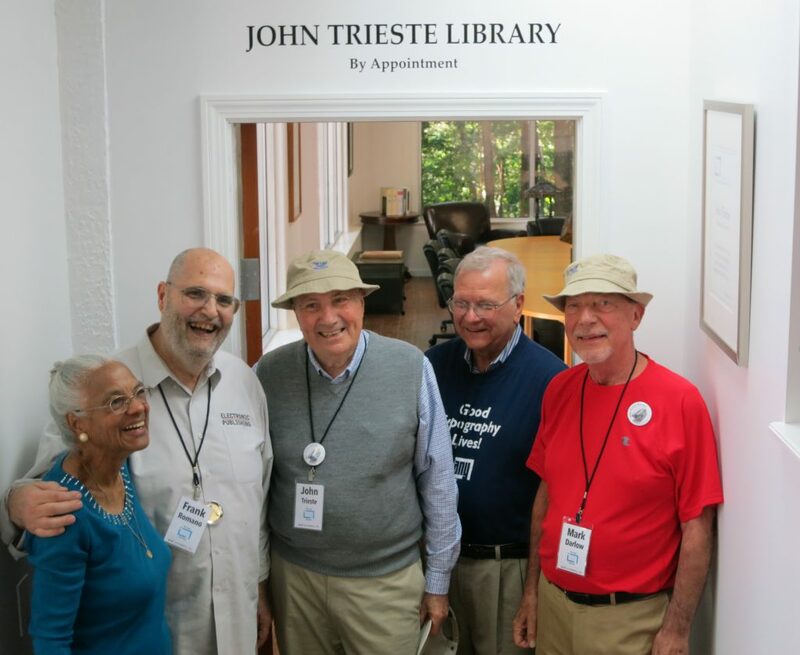 Frank Romano said that because of Trieste’s affectionate stewardship of the group, “TANY was my family” during the 10 years in which he commuted between his home in New Hampshire and the meetings he attended in New York City. Trieste hinted that although the gathering in his honor had been billed as the “last” assembly of the metro typographers, the term perhaps shouldn’t be taken too literally. The group may not exist any longer in the formal sense, but the camaraderie of its members lives on. As long as this continues to be true, there’s no reason to dispute his claim that the event in Haverhill was “the first of the last reunions” that TANY can look forward to celebrating. 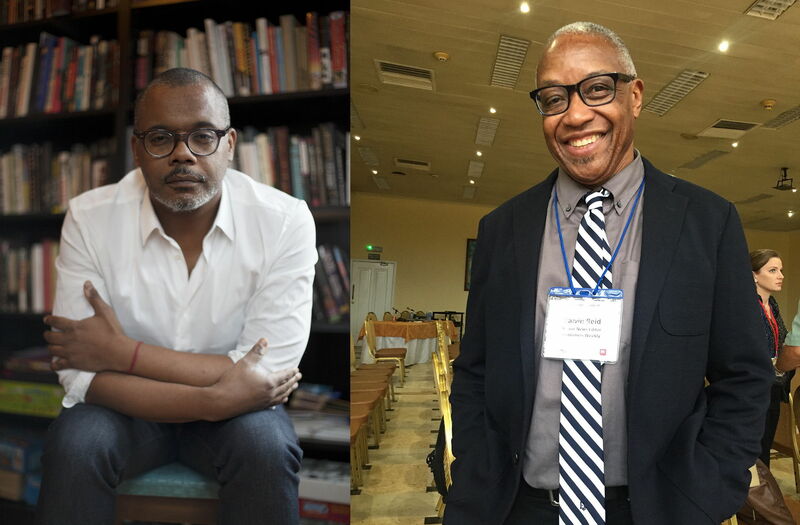 One World Books Publisher and Editor-in-Chief Chris Jackson will have a one-on-one conversation with Publishers Weekly Senior News Editor Calvin Reid at the Book Industry Guild of New York’s September 13, 2016 gathering. The discussion will provide an opportunity to learn first-hand about Jackson’s remarkable publishing career, his work with authors such as Ta Nehisi-Coates, Eddie Huang, and Jay Z, and Jackson’s strong interest in bringing diverse, multicultural voices to a worldwide audience. Earlier this year, Jackson was named the vice president, publisher, and editor of Random House’s One World imprint. He will direct the relaunch of the multicultural imprint in the fall of 2017. One World’s legacy includes fiction and nonfiction titles, with a focus on African-American writers. The event will be held on Tuesday, September 13, 2016, at Penguin Random House, 1745 Broadway in Manhattan. The speaking session will begin at 6:15 pm; a professional networking event will start at 5:15 pm. Admission for the September BIGNY event and networking reception is $40 for BIGNY members, $60 for nonmembers. There is a $5 fee for participants only attending the speaker portion of the event. Tuesday, September 13, 2016. Beer, wine, and hors d’oeuvres at 5:15 p.m., program at 6:15 p.m.
$40 for BIGNY members / $60 for nonmembers. $5 admission for the speaker portion of the event only. All major credit cards are accepted online and at the door. Cash and checks are also accepted at the door. Student admission is free (lecture only) with valid student ID and reservation. Chris Jackson is the Publisher and Editor-in-Chief of One World Books, a just relaunched imprint of Random House. Previously, Jackson was an Executive Editor at Spiegel & Grau from its founding in 2006. Prize-winning and bestselling authors he edited at Spiegel & Grau include Ta-Nehisi Coates, Bryan Stevenson, Jill Leovy, Matt Taibbi, Wes Moore, Victor LaValle, and Jay Z. Jackson is a native of New York, where he currently resides. Calvin Reid is a senior news editor at Publishers Weekly, co-editor of PW Comics World, PW’s online coverage of graphic novel and comics publishing, and cohost of More to Come, PW Comics World’s weekly podcast. BIGNY is a New York-based organization that serves the publishing industry and community. Since its inception in 1926, the Guild has provided professional development opportunities by hosting social and educational events, seminars, industry trips, and more. The Guild produces the annual New York Book Show, which celebrates outstanding achievements in book design and manufacturing. BIGNY also proudly organizes charitable events to promote literacy in the New York City metropolitan area. Printing Industries Alliance (PIA) says that its Post Drupa Report on August 18 was a resounding success. The event, held at the Club 101 in Manhattan, had an audience of more than 100 end users including printers, mailers, and other graphic arts service providers. The drupa exhibitors represented in the panel presentations included Canon, GMG, HP, Highcon, Konica Minolta, Landa Digital Printing, Muller Martini, Scodix, Xeikon, and Xerox. Marty Maloney, PIA’s executive vice president, commented, “Our Post Drupa Event had the same leading companies that hosted PIA’s VIP drupa tour in Düsseldorf. All of them were major attractions at drupa, and they represent the best of the best from the more than 1,800 drupa exhibitors”. The all-day program interspersed presentations and panel discussions and concluded with a networking session. It isn’t easy to attract an audience of 100 people to an event of any kind during business hours, but such was the drawing power of PIA’s Post Drupa Event on August 18. Hats off to the association not only for pulling in a crowd of that size, but also for enlisting the support of the impressive lineup of vendors who helped to make the day possible. Relatively few metro area printers ever have the means or the opportunity to attend drupa, so the deep interest in the program’s subject matter was no surprise. But, as this writer was reminded in moderating the panel on first-hand observations by drupa attendees, there is always something new to think about in the aftermath of the world’s biggest printing trade show. My astute and insightful panelists—Tim Freeman (PIA), Cheryl Kahanec (EarthColor), Tom Mackessy (LSC Communications), Michael Pallone (PubWorkX), and Simon Schaffer (Case Paper)—covered a lot of ground in their accounts of what they saw and learned at the show. Toward the end, one of them made a remark that struck a common chord with everyone. It was their shared observation that the mood and the morale of the industry seemed to be so much more upbeat at the international event than they are here at home. The panelists agreed that they’d felt a spirit of optimism about printing that doesn’t prevail—or at least isn’t easy to detect—among printers and other members of the industry in the U.S.
It’s a little hard to understand why. Although the industry struggled and contracted during the years of the Great Recession, it emerged from the downturn stronger in some ways than it had been when it entered. U.S. print service providers are still among the most technologically progressive printing businesses in the world. And, as Maloney’s presentation (summarized here) made plain, America’s graphic communications firms continue to create tremendous value for the national economy through print media—a fact that rarely gets the attention it deserves. PIA’s Post Drupa Event helped to dial up the pride while giving its attendees a show overview that literally was the next best thing to being there.